Usually by this time, the first week of October, we’re talking about the film that came out of the late summer film festivals to emerge as the frontrunner for the Best Picture Oscar and we begin its eventual coronation at the Dolby Theater. Not this time. As detailed in the most recent Frontrunner Friday and Oscar Podcast #57, we are entering unknown waters. There still is no real frontrunner. So much so that the two films that have a tie at #1 this month. 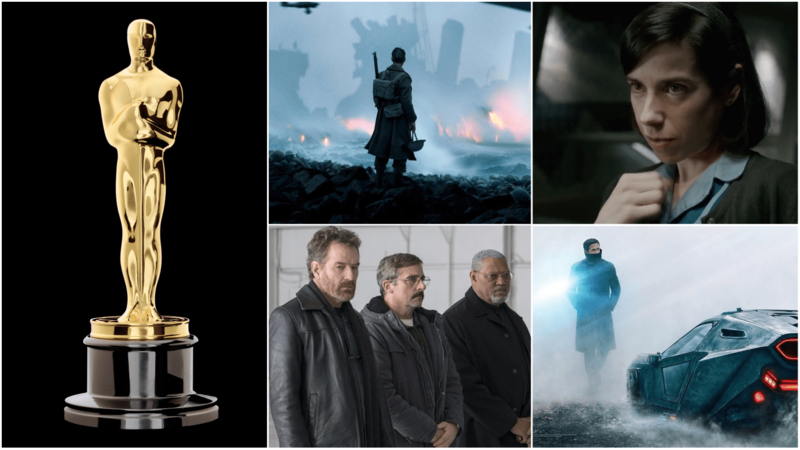 Warner Bros. Dunkirk, which has enjoyed the #1 spot for two months and Fox Searchlight’s The Shape of Water, which has climbed its way up the chart. Dunkirk‘s hold over the summer as a July release was itself unique. There hasn’t been a Best Picture winner that debuted in theaters with zero festival play since 2006’s The Departed. That film also won Martin Scorsese his long overdue Best Director Oscar. Many feel Dunkirk director Christopher Nolan has been long overdue not just for a win but for a mere nomination. Dunkirk was seen as his ticket; baity, traditional material (World War II), reminiscent of Saving Private Ryan (but far less bloody) that the Academy loves. Or do they? The Academy of 1998 or even 2006 is not the same Academy of 2017. Will traditionally baity material pass the smell test with this newer, younger, more diverse and more international Academy? Enter The Shape of Water. The Golden Lion winner at Venice, a huge hit at Telluride, this woman falls for fishman fantasy-thriller-romance from a beloved Mexican director (Guillermo del Toro) could be exactly the left of center choice for this new Academy. The very same Academy that just gave an LGBTQ and all-black starring film Best Picture for the first time in its history (that’s a first for both, by the way). The film’s early December release is its only drawback right now, but it’s a significant one. Steven Spielberg’s The Post, from 20th Century Fox and a pre-Dunkirk former #1 here, remains solidly in the top 3 and is now just one of two films on our chart that is completely unseen by anyone (the other being Paul Thomas Anderson’s Phantom Thread from Focus Features). A teaser for The Post is due this week so we’ll get our first glimpse of Meryl Streep and Tom Hanks as Katharine Graham and Ben Bradlee in this Washington Post/Pentagon Papers drama but the film, a very late December release, is still a ‘good on paper’ prediction and we also still haven’t had a December-released Best Picture winner since 2004’s Million Dollar Baby. La La Land looked like it was going to break that curse but it did not. The real surprise though this month isn’t the tie at #1. It’s Toronto International Film Festival People’s Choice winner Three Billboards Outside Ebbing, Missouri from Fox Searchlight. The film leaps from #13 last month all the way up to #4. It’s a major move, the biggest in a while on our charts and worth noting. We’ve examined the potential impact of the film’s TIFF win and why it should be taken seriously as a major Best Picture contender and last year’s Gold Rush Contest winner Bryan Bonafede even has it as his #1. Three Billboards not only won the TIFF People’s Choice, it also won the Screenplay award at Venice. It has a sweet November release date and despite trailers that lean heavy on the comedic elements of the film and Frances McDormand’s Oscar-worthy performance, there is a rooted drama at the film’s heart that could also play very well with the new Academy. It’s not without its drawback though; while the film played Venice and Toronto, it didn’t play Telluride, the festival that has given us our last seven Best Picture winners (either as a premiere or at least playing there) in a row. Call Me By Your Name from Sony Classics holds onto its Top 5 status and Focus Features is ramping up with Focus Features’ Darkest Hour. That film has been a sleeper for some but it is stealthily moving up the chart, going from #9 last month to #6 this month. Long seen as a slam dunk Best Actor win for Gary Oldman, the film (which played Telluride and Toronto) is becoming a major Best Picture contender. It’s just going to have to earn stronger reviews upon its release to get there. It’s currently at a 75 on Metacritic and 83 on Rotten Tomatoes and the in the current era of Best Picture we haven’t had a winner this decade with less than an 86 and 92, respectively. Getting to the two films that make up this month’s subtitle, Amazon’s Last Flag Flying from Richard Linklater debuted at the New York Film Festival to some surprisingly tepid reviews. Not all, to be sure, but enough to dull the film’s debut as a major player. Add to that the announcement from Amazon that Steve Carell would be pushed Lead and Bryan Cranston be submitted in Supporting, predictions for the film (and the performances) started tanking. Once the category placements were made public they were met with a good deal of grousing from Film Twitter and, coincidentally or not, Amazon removed the categories page for Last Flag Flying from the FYC section of their website. Some tinkering maybe? We’ll see. For now though, the film drops from #8 to #12. But other than Dunkirk it could be the main ‘dad’ movie of the season and even with a new Academy that old hook could be strong. It didn’t help Sully and that seemed a far easier get. Interestingly, a film that has benefited from the fall of LFF is another Amazon release, the summer sleeper hit The Big Sick. The film has grossed $42M putting just behind two-time Oscar winner Manchester by the Sea as Amazon Studios highest grosser. Sometimes a studio needs to pivot in order to solidly find its #1 film and this could be a time for that. Another Amazon film, Woody Allen’s latest, Wonder Wheel, will debut at NYFF as the festival’s closer on the 15th. We’ll know then if the film is a Best Picture push and just a vehicle for Kate Winslet. Next up is Blade Runner 2049. In the early summer many of us had the film (as well as Oscar-nominated director Denis Villeneuve) in our top 10 but then backed away. It still seemed like a strong below-the-line player but then the film played for critics last week and the response was overwhelmingly ecstatic. While most of are cautious that Warner Bros could pull off two Best Picture nominees in the same year (they’re often good for one, even a winner) the film re-enters the top 10 at #9. Falling off the chart this month are Downsizing, which has been such a yo-yo this summer. It’s been high, it’s been low. It’s fallen off and returned. This month, after some wildly different responses between Venice (mostly very good) and Telluride (surprisingly weak), Paramount’s $70M venture with Oscar winner Alexander Payne into sci-fi satire is back down. Sony’s Roman J. Israel, Esq. with Denzel Washington was also a hot ticket…until its Toronto bow. Possibly a too quick turnaround from production to reveal, the film was not well received and Washington’s chances at a third Oscar fall with it. Something to talk about though is – is there something we’re missing? I know Sasha Stone at AwardsDaily is really high on Battle of the Sexes. She has it at #7 in Best Picture right now. A handful of GoldDerby’s experts have the film in their top 10 as well. Most also have The Shape of Water and Three Billboards Outside Ebbing, Missouri in the top 5. That would mean Fox Searchlight would snag three Best Picture slots, something pretty difficult to achieve in an era of a nebulous number of BP nominees. I can see the pull of the film but it would be incredibly difficult for a single studio to spread itself so thin, especially after having to bounce back from last year’s The Birth of a Nation disaster. Here are the 2018 Oscar predictions in Best Picture for October from the Gold Rush Gang. Follow all predictions as they are updated live throughout the month right here.